Here at Group 3 Aviation, as a family-owned business for more than 20 years, we believe deeply in giving back to our community. As the year comes to a close, we wanted to take a moment to share some of our favorite charities and encourage your to consider giving to a cause that moves you. Since opening its doors in the 1970s, MEND (Meet Each Need with Dignity) has been transforming the lives of the neediest residents of the San Fernando Valley – poor children and their struggling families. More than 94 percent of the support and donations they receive goes toward providing emergency food, clothing, job training and placement assistance, English as a Second Language classes, youth activities, a Christmas program, and medical, vision and dental care. 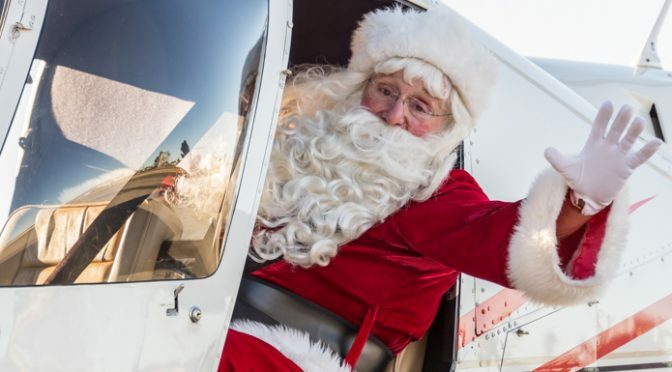 MEND is located just across the street from the runway at Whiteman Airport in Pacoima, Calif., making it the perfect location to watch Santa arrive by helicopter. For many years now we’ve donated our time and helicopter to bring St. Nick in to visit families at MEND for their extremely popular Christmas Program. From across the runway, eager young faces watch in anticipation as we fly by MEND and orbit so Santa can wave down to the crowd. When we land, he waves again before getting into a red Cadillac and is chauffeured to MEND where he greets the kids, poses for photos and gives out gifts. Seeing the magic and light of the season in each of those young faces is priceless. If you’re looking for a good local charity this season, a donation or volunteering for MEND has immediate positive effects on people here in our community. And if you’re around this Saturday, Dec. 10, stop by MEND to see us bring Santa in for his annual visit! The California Wildlife Center (CWC) provides emergency care, medical treatment, and rehabilitation to sick, injured, and orphaned California native wild animals throughout Los Angeles and Southern Ventura Counties. Serving more than 4,300 animals annually from sea lions and seals to songbirds and coyotes, CWC has cared for more than 44,000 animals since it opened in 1998 while staff and volunteers have responded to more than 30,000 calls every year about injured wildlife, coexisting with wild neighbors, and general wildlife questions. Relying on donations to support operations, the center receives no sustaining funding from the government. Each year we make not only cash contributions to the CWC, but our owners have also donated volunteer hours to care for injured animals. We feel it is our solumn duty to do what we can to help our native animals thrive. They were here long before the large populations of people. You can learn more about the CWC at their website and please consider helping protect injured and orphaned native California wildlife. Dedicated animal lovers and believers in sharing our world, we’re deeply concerned about elephant and rhino poaching. With close friends living in Africa and having visited several times, we’ve seen the damage first hand and the devastation of orphaned elephants and rhinos. We did a lot of research and determined the David Sheldrick Wildlife Trust was one of the best investments to help not only injured and orphaned elephants and rhinos, but also to help put an end to poaching. This amazing organization runs a full nursery and recovery center for the animals while at the same time educating the community and operating mobile veterinarian units and a full arsenal, that includes airplanes and helicopters, to fight poaching in hopes of stopping poachers before the damage is done. Every year we adopt orphaned elephants and send financial support to help bring an end to the decline of these magnificent animals at the hands of poachers. If you’ve been wondering what you can do to help these animals, consider looking into the David Sheldrick Wildlife Trust. It is money well spent. However you choose to give back to your community this season, we encourage everyone to share their good fortune. It is truly better to give than receive. Happy Holidays!